I finally had some time and spent some hours on Inversion of Control (IoC) and Dependency Injection (DI). When I did the same a few weeks ago I did not understand a lot. I got lost on the concept of inversion. I tried to figure out, what the inversion was. This blocked all and I ended up pretty much blank despite nearly an hour of pumping information into my head. When you get lost then you should do it at least properly and at full steam 😉 Well, I finally understood the headline … and the world started making sense again. An entirely hardcoded class controls the program execution path. All branches are predetermined. By using interfaces you can decouple theses flows, so that at the time of creation the class does not exactly know what instructions to call next. Let’s say you are using events. The class, which is raising an event, hands the control over to another class. The subscribing class is in control of the program flow, not the class that raises the event. The subscribing class can subscribe or unsubscribe. The class, which is providing the event, should not have any active control over subscriptions. Hence it is an inversion of control. By using IoC classes become more encapsulated. Let’s say a perfect class is blind and urgently needs a guide dog. The control can now be taken over by external factors. This inverts the control entirely. Unit testing uses that mechanism. A container can be used to control classes and change the bindings. 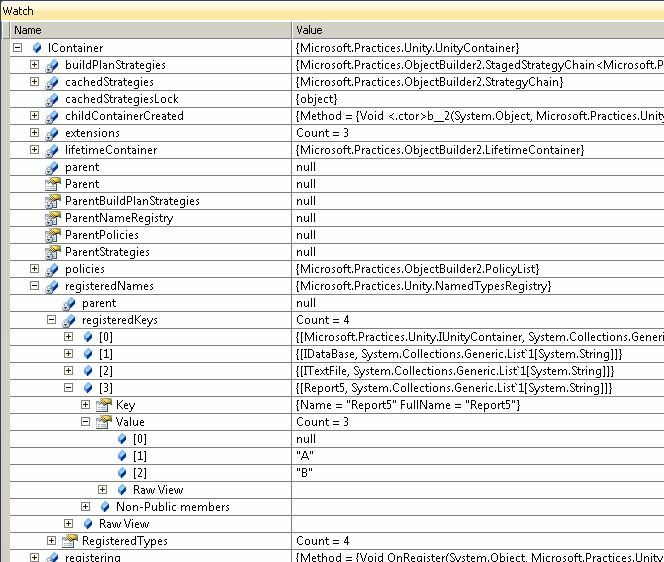 The expression “container” is rarely used in C#. The C++ world calls containers what C# calls collections. We have come across containers in my C++ posts. Follow the link for a quick refresher. To simplify the matter we can call a UnityContainer a dictionary of objects with some additional methods. This container performs binding between components. For instance it replaces all specific interface declarations by fully instantiated classes without the need to explicitly call any initialization. The structure of a program is: Input, Calculations, Output. The same generally applies to classes. Let’s say you want to run an analysis of a text file. That analysis class can only function properly if the required text file does exist. The calculations depend on the input. The same applies to the output, which can only run if the calculation was successful. The input class calls the calculation class, which in turn calls the output class. As we are discussing inversion, let’s decouple the classes and implement events. In this case the output class subscribes to the calculation result event and the calculator subscribes to the input event. “Dependency Injection” is a subset of “Inversion of Control”. IoC is a principle, whereas DI is an actual implementation of the principle. DI is a software design pattern that allows removing hard-coded dependencies. First of all you do not create objects directly; you just describe how they look like. To accomplish this, the pattern uses interfaces or base classes. As the dependency is not hardcoded, the actual object can vary each time. It just needs to fulfill the inheritable pattern of an interface or base class. What are the benefits of interfaces besides multiple inheritance? Several people can work on different problems simultaneously by using interfaces. One person for instance writes the code for logging to text files and another person writes the code for logging to databases. If both use the same interface definition, then the underlying classes can be easily replaced by each other. Interfaces are like promises to provide predefined class patterns at runtime. Thus we end up with component separation, which is very useful in unit testing. Interfaces can eliminate unfathomable dependencies if used wisely. When you run unit tests, then you will need input data. But it could be too complex to run the entire program just to test some methods. You would try to only instantiate the minimum requirements. Think of a syringe and inject the data into the test case to create an acceptable environment. This can be difficult in case the program was not structured well. You need to examine the code to find dependencies. There are several ways to implement dependencies in a class. The easiest way is to have a field that holds a reference to the dependency, which is probably the worst approach you can have in terms of flexibility. You can use methods or properties to tell your classes what dependency objects they should use. The best approach though is via constructors. You can hardly miss parameters when trying to call the constructor. Of course bad constructor overloading can jeopardize this concept. If the world was just like class Report4, then we could more or less end the post here. Unfortunately dependencies are often not that obvious. They are well hidden and you need to read the code thoroughly to build unit tests. Dependency Injection goes further and the real take off takes place with Moq, which I will explain in the follow-up post. The following code example was didactically compiled. You don’t need any further information, it should be self-explanatory. You can download unity by following this link or using NuGet. r = lContainer.Resolve<Report5>(); Console.WriteLine("got " + r.Text); // same instance !!!!! Resolution of the dependency failed, type = “Report5”, name = “(none)”. Posted on March 26, 2014, in Advanced, C#, Programming Patterns, Unit Testing and tagged advanced, C#, C-sharp, Delegate, Dependency Injection, DI, Event, Interface, Inversion of Control, IoC, Observable Pattern, programming, Programming Pattern, Source code. Bookmark the permalink. 2 Comments.